Junior Rollators, manufactured by Merits, are Rollator Walkers that are designed for smaller or pediatric people. 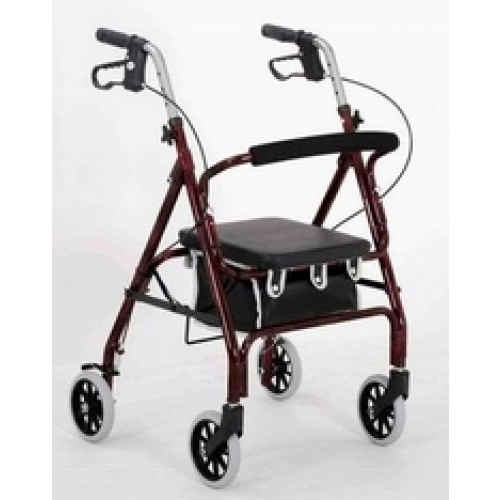 This Junior Rollator is designed to be easily used. The oversized 6 Inch wheels promote stability and maneuverability. The locking brakes are designed to reduce the risk of falling. This pediatric rollator is lightweight, at just 14.5 lbs., so it can be lifted easily when transporting. 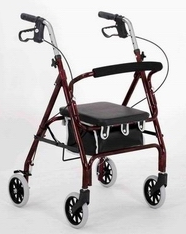 This Merits walker Safety Rollator comes standard with a vinyl pouch for storage. This pouch is located under the seat and is perfect for carrying school supplies, a wallet, or anything else you may need. Padded tube backing is removable for convenience. Vinyl pouch is perfect for storing items that cant be carried while using a rolling walker. Bolted in handle tubes for safety. The height of the chair is measured at 19 inches.